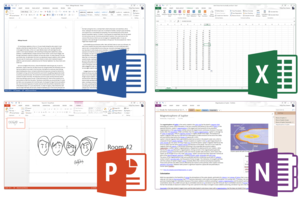 Microsoft Office 2013 applications from top left to bottom right: Word, Excel, PowerPoint and OneNote which collectively make up the Home and Student edition. Microsoft Office 2013 (codenamed Office 15) is a version of Microsoft Office, a productivity suite for Microsoft Windows. It is the successor to Microsoft Office 2010 and the predecessor to Microsoft Office 2016. It includes extended file format support, user interface updates and support for touch among its new features. Office 2013 is suitable for IA-32 and x64 systems and requires Windows 7, Windows Server 2008 R2 or a later version of either. A version of Office 2013 comes included on Windows RT devices. Mainstream support ended on April 10, 2018. Extended support ends on April 11, 2023. On February 25, 2014, Microsoft Office 2013 Service Pack 1 (SP1) was released. Development started in 2010 while Microsoft was finishing work on Office 14, released as Microsoft Office 2010. On January 30, 2012, Microsoft released a technical preview of Office 15, build 3612.1010, to a selected group of testers bound by non-disclosure agreements. On July 16, 2012, Microsoft held a press conference to showcase Office 2013 and to release the Consumer Preview. The Office 2013 Consumer Preview is a free, fully functional version but will expire 60 days after the final product's release. An update was issued for the Office 2013 Customer Preview suite on October 5. Office 2013 was released to manufacturing on October 11, 2012. It was made available to TechNet and MSDN subscribers on October 24, 2012. On November 15, 2012, 60-days trial versions of Microsoft Office 2013 Professional Plus, Project Professional 2013 and Visio Professional 2013 were made available to the public over the Internet. Microsoft has released Office 2013 for general availability on January 29, 2013. Microsoft released the service pack 1 update on February 25, 2014. Office 2013 is more cloud-based than previous versions; a domain login, Office 365 account, or Microsoft account can now be used to sync Office application settings (including recent documents) between devices, and users can also save documents directly to their OneDrive account. Microsoft Office 2013 includes updated support for ISO/IEC 29500, the International Standard version of Office Open XML (OOXML) file format: in particular it supports saving in the "Strict" profile of ISO/IEC 29500 (Office Open XML Strict). It also supports OASIS version 1.2 of ISO/IEC 26300:2006, Open Document Format, which Office 2013 can read and write. Additionally, Office 2013 provides full read, write, and edit support for ISO 32000 (PDF). The Office Web Apps suite was also updated for Office 2013, introducing additional editing features and interface changes. The following features are removed from Microsoft Office 2013. Only basic version of help files available while offline. There is no longer an option to install local help files during installation. The original license agreement for retail editions of Microsoft Office 2013 was different from the license agreements of retail editions of previous versions of Microsoft Office in two significant ways. The first of these was that the software could no longer be transferred to another computer. In previous versions of Office, this restriction applied only to OEM editions; retail Office license agreements allowed uninstalling from one computer to install on another computer. Digitally downloaded copies of Office were also said to be permanently locked to that PC's hardware, preventing it from being transferred to any other computing device. Should the buyer have wished to use Office 2013 on a different computer, or if they later became unable to use the computing device that the original license was downloaded to (e.g. hardware became inoperable due to malfunction) then a completely new, full-priced copy of Office 2013 would have to have been purchased to replace the prior one. Microsoft stated that this change was related to the software piracy that has been rampant for years, worldwide. However, many commentators saw this change as an effort to forcibly move its customers towards the subscription-based business model used by the Office 365 service. The legality of this move, particularly in Europe, has been questioned. However, on March 6, 2013, Microsoft announced that equivalent transfer rights to those in the Office 2010 retail license agreements are applicable to retail Office 2013 copies effective immediately. Transfer of license from one computer to another owned by the same user is now allowed every 90 days, except in the case of hardware failure, in which the license may be moved sooner. The first user of the product is now also allowed to transfer it to another user. The second difference, which remains in the updated licensing agreement, is that the software can be installed on only one computer. In previous versions of Office, this restriction also applied only to OEM editions; retail Office license agreements allowed installing the product on two or three computers, depending on the edition. As with previous versions, Office 2013 is made available in several distinct editions aimed towards different markets. All traditional editions of Microsoft Office 2013 contain Word, Excel, PowerPoint and OneNote and are licensed for use on one computer. Home & Business: This retail suite includes the core applications Word, Excel, PowerPoint, and OneNote plus Outlook. Standard: This suite, only available through volume licensing channels, includes the core applications Word, Excel, PowerPoint, and OneNote plus Outlook and Publisher. Professional: This retail suite includes the core applications Word, Excel, PowerPoint, and OneNote plus Outlook, Publisher and Access. Professional Plus: This suite, only available through volume licensing channels, includes the core applications Word, Excel, PowerPoint, and OneNote plus Outlook, Publisher, Access, InfoPath and Lync. The Office 365 subscription services, which were previously aimed towards business and enterprise users, were expanded for Office 2013 to include new plans aimed at home use. The subscriptions allow use of the Office 2013 applications by multiple users using a software as a service model. Different plans are available for Office 365, some of which also include value-added services, such as 20 GB of OneDrive storage (later increased to 1 TB) and 60 Skype minutes per month on the new Home Premium plan. These new subscription offerings were positioned as a new option for consumers wanting a cost-effective way to purchase and use Office on multiple computers in their household. A special version of Office 2013, initially known as Office 2013 Home & Student RT, is shipped with all Windows RT devices. It initially consisted of Word, Excel, PowerPoint and OneNote. In Windows RT 8.1, the suite was renamed Office 2013 RT and Outlook was added. The edition, whilst visually indistinguishable from normal versions of Office 2013, contains special optimizations for ARM-based devices, such as changes to reduce battery usage (including, for example, freezing the animation of the blinking cursor for text editing during periods of inactivity), enabling touch mode by default to improve usability on tablets, and using the graphics portion of a device's SoC for hardware acceleration. Windows RT devices on launch were shipped with a "preview" version of Office Home & Student 2013 RT. The release date for the final version varied depending on the user’s language, and was distributed through Windows Update when released. On June 5, 2013, Microsoft announced that Windows RT 8.1 would add Outlook to the suite in response to public demand. Office RT modifies or excludes other various features for compatibility reasons or resource reduction. To save disk space; templates, clip art, and language packs are downloaded online rather than stored locally. Other excluded features include the removal of support for third-party code such as macros/VBA/ActiveX controls, the removal of support for older media formats and narration in PowerPoint, editing of equations generated with the legacy Equation Editor, data models in Excel (PivotCharts, PivotTables, and QueryTables are unaffected), searching embedded media files in OneNote, along with data loss prevention, Group Policy support, and creating e-mails with information rights management in Outlook. As the version of Office RT included on Windows RT devices is based off the Home & Student version, it cannot be used for "commercial, nonprofit, or revenue-generating activities" unless the organization has a volume license for Office 2013 already, or the user has an Office 365 subscription with commercial use rights. Alongside Office RT, free versions of OneNote and the Lync client were made available as Windows Store apps upon the release of Windows 8 and RT. The OneNote app, originally known as OneNote MX, contains a limited feature set in comparison to its desktop version, but is also optimized for use on tablets. The OneNote app has since received several major updates, including camera integration, printing abilities, and multiple inking options. Windows Phone 8 ships with an updated version of the Office Mobile suite, consisting of mobile versions of Word, Excel, PowerPoint, and OneNote. In comparison to their Windows Phone 7 versions, the new versions add an improved Office Hub interface that can sync recently opened and modified documents (including changes to documents stored via Office 365 and SkyDrive), a separated OneNote app with additional features (such as voice notes and integration with the new "Rooms" functionality of the OS), and improved document editing and viewing functionality. In June 2013, Microsoft released a version of Office Mobile for iPhone; it is similar to the Windows Phone version, but originally requires an Office 365 subscription to use. A version for Android smartphones was released in July 2013; it, too, originally needed Office 365 for use. Apps for iPad and Android tablet computers were released in March 2014 and January 2015, respectively. These, along with their smartphone equivalents, have been made free for personal use, though certain premium features have been paywalled and require Office 365, which includes licensing of the apps for business use. Windows 10 Mobile that was released in December 2015 included new Office apps, more in line with their iPhone and Android equivalent, and making use of the "universal app" platform pioneered with Windows 10. 1 The Windows RT versions do not include all of the functionality provided by other versions of Office. 2 Commercial use of Office RT is allowed through volume licensing or business subscriptions to Office 365. 3 Windows Store versions are also available. 4 InfoPath was initially part of Office 365 Small Business Premium. However, it's currently unavailable though subscription. ^ a b c Page, Carly (January 28, 2013). "Microsoft says Office 2013 will arrive on 29 January". The Inquirer. Incisive Media. Retrieved January 29, 2013. ^ "Update history for Office 2013". Retrieved 2019-03-28. ^ a b c "System requirements for Office 2013". Microsoft TechNet. Microsoft. December 4, 2012. Office 2013 for Personal Computers--standard system requirements. Retrieved December 19, 2012. ^ "Language identifiers and OptionState Id values in Office 2010". Microsoft. May 12, 2010. Retrieved August 16, 2010. ^ "Exclusive: A sneak peek at Office Web Apps Preview, coming with Office 2013 (and a new logo!)". ^ "Office 2013 Public Preview: Multi-Touch and Gesture Support". Paul Thurrott’s WinSupersite. June 16, 2012. Retrieved August 27, 2012. ^ "System requirements for Office 2013". TechNet. Microsoft. Retrieved April 22, 2016. ^ Whitney, Lance (July 19, 2012). "XP and Vista users, no Office 2013 for you". CNET. CBS Interactive. Retrieved April 22, 2016. ^ Warren, Tom (July 16, 2012). "Office 2013 drops support for Windows XP and Windows Vista". The Verge. Vox Media. Retrieved April 22, 2016. ^ McDougall, Patrick (July 18, 2012). "Office 2013 Won't Run On Windows XP, Vista". InformationWeek. UBM plc. Retrieved April 22, 2016. ^ "Building Windows for the ARM processor architecture". Microsoft. February 9, 2012. Retrieved June 28, 2012. ^ a b Koenigsbauer, Kirk (October 11, 2012). "Office Reaches RTM!". Office News. Microsoft. Retrieved November 20, 2012. ^ "List of all Service Pack 1 (SP1) updates for Microsoft Office 2013 and related desktop products". Microsoft. February 25, 2014. Retrieved February 25, 2014. ^ "Microsoft Office 15 Begins Technical Preview: Tablet Readiness Questioned". PC World. January 30, 2012. Retrieved August 26, 2012. ^ Gallagher, Sean (July 16, 2012). "Office 2013: Microsoft's bid to win the future". Ars Technica. Retrieved June 7, 2013. ^ "Microsoft Office 2013 (aka 15) beta release date 'today'". Commputerworld.com. July 16, 2012. Retrieved August 27, 2012. ^ "Office 2013 Consumer Preview Expiration Date?". techdows.com. July 17, 2012. Retrieved February 24, 2013. ^ "Office 2013 Update Available for build 15.0.4128.1025". Neowin.net. October 5, 2012. Retrieved October 13, 2012. ^ Schneider, Chris (February 25, 2014). "Office 2013 Service Pack 1 now available". Office News. Microsoft. Retrieved February 25, 2014. ^ "Office 2013 Tip: Personalize the Office Applications". Paul Thurrott's Supersite for Windows. Retrieved March 27, 2013. ^ a b "New file format options in the new Office". Office Next. August 13, 2012. Archived from the original on September 18, 2012. Retrieved June 7, 2013. ^ "Office 2013 Web Apps: A step forward, but still dependent on the desktop". Ars Technica. Retrieved March 12, 2013. ^ "What's new in Office 2013". MIcrosoft. Retrieved February 18, 2013. ^ "What's new in Word 2013". Microsoft. Retrieved February 18, 2013. ^ Mullins, Robert J. (July 16, 2012). "Microsoft Touts Office 2013 Integration With Skype, Yammer, Cloud". eWeek. QuinStreet. Retrieved July 29, 2013. ^ Bellew, Allie (October 18, 2012). "The New IMAP in Outlook 2013". Outlook Blog. Microsoft. Retrieved July 29, 2013. ^ "Data Model specification and limits". Office.com. Microsoft. Retrieved July 29, 2013. ^ "Define and use names in formulas". Office.com. Microsoft. Retrieved July 29, 2013. ^ na, na. "Changes in Office 2013". Microsoft. Retrieved May 8, 2013. ^ Outlook Team (October 18, 2012). "The New IMAP in Outlook 2013". Outlook Blog. Retrieved November 2, 2012. ^ Thomas, Raul. "Outlook 2013 : Unable to connect to an Exchange 2003 mailbox". Rahul Thomas Blogs, MSDN Blogs. Retrieved February 1, 2013. ^ "Office 2013 available now: Microsoft ditches DVDs in push for cloud subscriptions". The Verge. Retrieved March 3, 2013. ^ James, Daniel (March 7, 2013). "Microsoft clarification: Office 2013 is available on DVD, if stores choose to stock it". BIT. Haymarket Media Group. Retrieved June 7, 2013. ^ a b c d Thurrott, Paul (February 14, 2013). "Office 2013 Gotcha: Standalone Products are for One PC Only". Paul Thurrott's SuperSite for Windows. Penton Media. Retrieved February 15, 2013. ^ "What Office 2013's draconian licensing policy really means for you". PC World. Retrieved March 12, 2013. ^ Bright, Peter (February 17, 2013). "Why Microsoft's new Office 2013 license may send users to Google Docs". Ars Technica. Retrieved May 27, 2013. ^ "Microsoft confirms Office 2013 licenses can't be transferred to other computers". engadget.com. Retrieved February 17, 2013. ^ "Microsoft Office 2013 lockdown aims to boost cloud services - Techworld.com". News.techworld.com. Retrieved May 27, 2013. ^ "Microsoft: Office 2013 license is for just one PC, FOREVER". The Register. Retrieved February 25, 2013. ^ "Office News - Office 2013 now transferable". Blogs.office.com. March 6, 2013. Archived from the original on May 25, 2013. Retrieved May 27, 2013. ^ "Microsoft retreats from Office 2013 restrictive licensing". Computerworld. March 6, 2013. Retrieved May 27, 2013. ^ a b c d e Paul Thurrott (September 17, 2012). "Office 2013: Pricing and Packaging | Office content from Paul Thurrott's SuperSite for Windows". Winsupersite.com. Retrieved November 21, 2012. ^ a b c "Compare suites available through volume licensing". Microsoft Office website. Microsoft. Retrieved January 29, 2013. ^ Thurott, Paul (September 18, 2012). "Office 2013: Pricing and Packaging". Penton. Retrieved September 18, 2012. ^ "Office 2013 vs. Office 365: Should you buy or rent?". Retrieved March 15, 2013. ^ "Microsoft to deliver final version of Office 2013 RT starting in early November". ZDNet. September 14, 2012. Retrieved October 5, 2012. ^ "Building Office for Windows RT". Microsoft. September 14, 2012. Retrieved October 5, 2012. ^ a b "Microsoft Details Office 2013 RT Availability and Features". Tablet PC Review. September 14, 2012. Retrieved October 5, 2012. ^ a b "Outlook finally coming to Windows RT tablets". CNET. Retrieved June 5, 2013. ^ "Windows RT won't get full Office 2013". PC Pro. August 8, 2012. Retrieved October 5, 2012. ^ a b "Microsoft Office for Windows RT: How to move to a commercial-use license". ZDNet. Retrieved October 27, 2012. ^ "Microsoft's Lync and OneNote apps for Windows 8, Windows RT now in Windows Store". ZDNet. CBS Interactive. Retrieved March 14, 2013. ^ "OneNote MX: First Take". ZDNet. CBS Interactive. Retrieved March 14, 2013. ^ "Microsoft's touch-friendly Office apps now available to download for Windows 10". PC World. IDG. Retrieved 6 February 2015. ^ "Windows Phone 8: A tour of the business features". ZDNet. Retrieved March 22, 2013. ^ "Introducing the new Office on Windows Phone 8". Office Next. Microsoft. Retrieved March 22, 2013. ^ "Office Mobile for iPhone Review". Paul Thurrott's Supersite for Windows. Retrieved June 15, 2013. ^ "Microsoft releases Office Mobile for Office 365 Android app". GSMArena. Retrieved August 9, 2013. ^ Emil Protalinski (27 March 2014). "Office for iPhone and Android phones is now completely free, Android tablet version coming 'in the future'". The Next Web. ^ "The next chapter of Office on Windows". Office Blog. Microsoft. Retrieved 6 February 2015. ^ "Windows 10 will start rolling out to phones in December". The Verge. Vox Media. October 6, 2015. Retrieved October 7, 2015. ^ "Compare Microsoft Office Products & Subscription Plans". Microsoft Office website. Microsoft. Retrieved January 29, 2013. ^ "What's included in the Office 365 Preview?". Microsoft. Retrieved January 9, 2013. ^ "Office 365 Personal". Office 365 Blog. Microsoft. Retrieved March 16, 2014. ^ "Office 365 University". Office 365 Portal. Microsoft. Retrieved February 3, 2013. ^ a b "The new Office 365 subscriptions for consumers and small businesses". Microsoft.com. Retrieved January 10, 2013. ^ a b Paul Thurrott (July 16, 2012). "Office 2013 Public Preview: Office 365 for Home and Businesses | Office content from Paul Thurrott's SuperSite for Windows". Winsupersite.com. Retrieved November 21, 2012. ^ "Microsoft Office Home Premium 2013 Preview - Official Site". Microsoft.com. Retrieved November 21, 2012. ^ Arar, Yardena Arar (February 27, 2013). "Decoded: Microsoft's puzzling Office 365 rollout". PC World. IDG. Retrieved July 24, 2014. ^ Thurrott, Paul (May 8, 2013). "The Office 365 Upgrade: From Small Business to Small Business Premium". SuperSite for Windows. Penton Media. Retrieved July 24, 2014. ^ "Office 365 Small Business Premium". Microsoft Office website. Microsoft. Retrieved July 24, 2014. This page was last edited on 14 April 2019, at 10:16 (UTC).